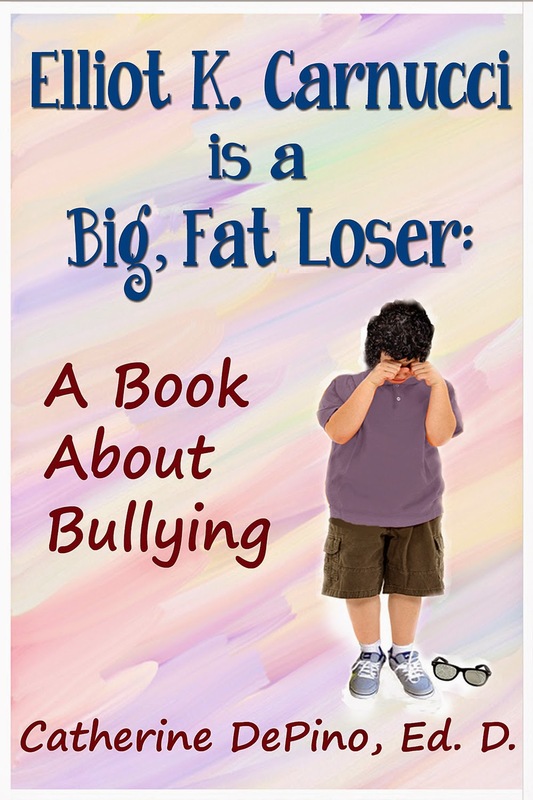 Goddess Fish Promotions is organizing a Virtual Book Tour for Elliot K. Carnucci is a Big, Fat Loser: A Book about Bullying by Catherine DePino, a Middle Grade (8-14) fiction book available now from Book Baby Publishing. The tour will run June 16, 2014 to July 18, 2014, and Catherine is available for guest post and interviews. An ePub and Mobi copy of the book is available for review in conjunction with a guest post or interview. Catherine will be awarding a $20 Amazon GC to a randomly drawn commenter during the tour. Congratulations to Mary P.
The kids at Ralph Bunche Middle School love to pick on Elliot Kravitz-Carnucci. He struggles with his weight, looks like a geek, makes top honors, and lives above the Carnucci Home for Funerals in South Philadelphia with his distant, workaholic father and Nonna, his quirky, overbearing grandmother. Since his parents divorced, he splits spending his time with his funeral director father and his mother Rayna, who dreams of becoming the queen of commercials on the west coast. At the hands of his peers, Elliot experiences a series of bullying episodes that escalate from entrapment in a school supply closet to a brutal “swirly” (head dunk in the toilet) that lands him in the hospital emergency room. Elliot has a small circle of loyal friends and a mentor named Duke, an aging school custodian, who root for him to overcome his bullying issues so that he can enjoy his life as a teenager and a budding singer/performer. Can Elliot win his fight against the nasty bullies, or is he doomed forever? Read this funny, sad, and crazy book to find out. I can review any date during the tour. Thanks. I can take June 27. I would like to please review and interview on 6/18 at Andi's Middle Grade & Chapter Books. Sending you my questions. Thanks! We'd like to host at Book 'Em North Carolina on June 23. Guest post should be on how to recognize that someone is being bullied, and what the average person can do to help stop bullying. I'd like to host on Reviews and Interviews 6/19 or 6/24 with an interview. thanks! Guest Post - What experience led you to write about bullying? Book Reviews by Dee can host on July 7 with a guest post. Thanks. I'll do June 25 on the TeacherWriter blog. Thanks! I'll take July 10th with a review (mobi. If you need another host, Angela Myron's blog can participate. 3 Partners in Shopping, Nans, Mommy, & Sissy, Too! I can do a promo and interview on whichever date you need on Sharing Links and Wisdom, though I prefer the 18th.